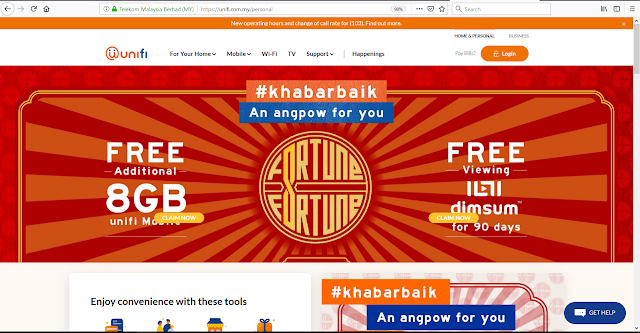 Unifi, the premier Convergence brand under Telekom Malaysia Berhad (TM) shared its plan for 2019 through its #khabarbaik movement, which is set to bring more good news Malaysians nationwide. The #khabarbaik movement represents unifi’s commitment to continue raising the bar on its products and services as unifi constantly innovates and understands its customers’ needs. unifi hopes that the movement will be a shift in attitude and approach that seeks to spread positivity, and this has been implemented internally since the beginning of 2019. #khabarbaik is the attitude that will be embraced by each and every employee of unifi that will translate to how the business is run and the positive changes it will bring to consumers and Malaysia at large. By introducing simpler and more affordable plans, open for subscription to all Malaysians, unifi is able to make internet connectivity more accessible to all citizens, ensuring that Malaysians from all walks of life are able to benefit from the digital lifestyle. Moharmustaqeem Mohammed, Acting Executive Vice President, unifi, said the #khabarbaik initiative premises on digital adoption and a converged lifestyle for all - TM will continue to work hard to address customer pain points. New unifi Mobile postpaid lineup which caters customized plans for different digital lifestyles at the right price points - for example, from the teenager who consumes many videos on the move, parents with young ones that love to explore educational content online, to the grandparent who uses data primarily to keep in touch with their family members. ‘Adik’ / Mobile 19 plan, who might not need as much data, can opt for a smaller mobile data plan of 2GB (1GB LTE + 1GB 3G) at only RM19 - comes with five (5) minutes talk time and 25 SMS. ‘Kakak’ / Mobile 39 - 3GB (2GB LTE + 1GB 3G) and 5GB (4GB LTE + 1GB 3G) respectively – along with 50 minutes talk time and 25 SMS. Mobile 59 - comes with 9GB LTE + 1GB 3G, 100 minutes talk time, and 25 SMS. In another exciting update, aggressive speed upgrading exercise to unifi packages are currently ongoing for existing Streamyx customers residing in unifi coverage areas. Meanwhile, for Streamyx customers in non-unifi coverage areas, TM is committed to to bring high speed broadband to them through alternative technologies by TM or other infrastructure providers - where technology permits, TM is doubling the Streamyx speed at the same price of their current broadband plan. In total, about 1 million are eligible for the turbo upgrading exercise. Existing unifi customers will see up to a tenfold speed boost with the turbo upgrades; from 10Mbps to 100Mbps, from 30Mbps to 300Mbps, from 50Mbps to 500Mbps, and from 100Mbps to 800Mbps – all at the same rates that they are currently paying. To date, TM has successfully upgraded over 910,000 unifi customers and more than 66% of over 340,000 Streamyx customers residing in unifi coverage areas to unifi; at the same price of their current plan. The rest of the 130,000 Streamyx customers who have yet to grab this opportunity for the free upgrade are encouraged to do so. TM hopes to complete this upgrading exercise by March 2019. The Unifi and Streamyx upgrades are good news for loyal fans of TM. This comes after the new government of Malaysian announced commitment to double the speed and half the price of Internet connectivity for Malaysian. unifi SET TO BRING MORE #khabarbaik NEWS IN 2019.